Markus joined us for Mother's Day. 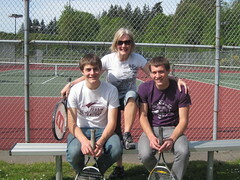 After church, we enjoyed a Kim's Teriyaki 'party tray,' then hustled off to enjoy the weather at the tennis courts. The old fogey's still have the swing as we beat the young boys in a tight match. We refreshed ourselves with Coldstone ice cream in Bremerton and then enjoyed the sunshine at Harborside Park and waterfront area. The Spring weather seems to have finally arrived.